For any successful organization, communication is essential. Visual graphics are one of the most impactful aspect that will enhance communication. 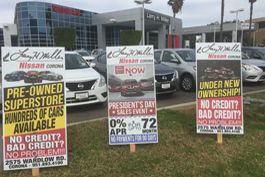 From retail point-of-purchase to sports graphics, large event backdrops and interior signs, Roadside Advertising has been helping clients nationwide. When it comes to jobs that are just too big, require a faster turnaround time or lower set-up costs than silk-screening, we are the best option you can find for over size printing . With our HP FB950 digital UV ink printer and its 8’ wide flatbed and belt drive, Roadside Advertising can print with great speed & efficiency. Our printer never gets tired so we can print around the clock. 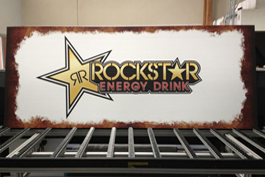 In addition to Coroplast, we print on numerous other substrates including: Acrylic, Aluminum, Lexan, Foam-Cor, GatorBoard, PVC, Sintra, UltraBoard, DiBond, OmegaBond, OmegaBoard and more. We all know that the majority of consumers are out on the weekends. One of a businesses tallest hurdles is figuring out how to get those consumers into their store. The most effective solution is a weekend event. Our event team can coordinate the production of signs, placement of road signs and manage sign walkers much like a well conducted orchestra. The result is more foot traffic in your store, therefore more sales. Whether you are going out of business or just trying to build your business a weekend event is the place to start. Check out these friendly links to find what best fits your advertising goals.